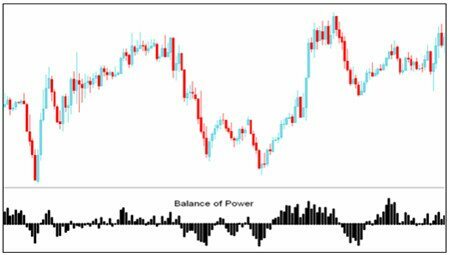 This is an indicator, called balance of power, which was developed by Igor Livshen. The method for using this indicator is as the name already say, it measures the balance beetwen uptrend and downtrend and which one of these is more powerfull. It does this by analysis of price movement over the period of time. It can also be used for binary options trading and that is why we will go through it. WHAT IS BALANCE OF POWER? Balance is everywhere around us, it is in nature, where when it is breaked, we get consequences with natural disasters. Same applies to rules of countries and where we live. If everything is in balance then we have no war. Something similiar comes with this indicator where this histogram is similiar to MACD. It is simple, when one side of the trade is more powerfull then the other, this balance of power goes into their favor. Meaning that if you want to calculate daily balance you have to substract first closing price from the opening and then you have to divide the number you get by the high price substracting from the low price. WHAT CAN THIS INDICATOR SHOW YOU? You can use the indicator in different time frames. It can give you signals for crossovers, convergences and also divergences. The basid signal is the line crossover. When you see a trend following crossover you can see it is a strong signal. For example we can take a look at this, trend crossover on the chart with daily prices can be good for a movement which can last from days to weeks. It si recommended for beginners to use trend following since it is easier. WHY IS IT BAD AND WHY IS IT GOOD? As you know, every indicator can be bad at some point. I would suggest that you use this tool in combination with other tool so you can increase your profitability. If you will use it on your own, it can happen that you will get alot of false signals. It is good if it is used with trend following as i said for the beginners since you can see more clear signal. Of course it is also good for more expirienced traders which can get good data or signlas from the tool. This indicator is nothing specila but it is not bad at all. It uses a simple formula which we have described and also gives you nice and simple to follow signals, especially in trend following. I precisely needed to say thanks yet again. I do not know what I could possibly have carried out without the pointers shared by you directly on such area of interest. It actually was a frightening difficulty in my view, nevertheless being able to view this skilled technique you resolved the issue forced me to cry for contentment. I’m just thankful for the work and even wish you comprehend what a great job you were undertaking educating many others thru your web blog. I know that you have never met all of us.